When we set new users up with HomeKeeper, they actually get a suite of tools with lots of different types of functionality. HomeKeeper, the Nonprofit Starter Pack, and Salesforce all work together to help support the work you do. Most of the time, you won't even notice where one package ends and another begins. There are lots of resources available to help you use each of them to their full potential, and some of our favorites are listed here. If you run into a problem and don't know where to start, you can always ask us by submitting a request at homekeeper.zendesk.com, and we'll get you pointed in the right direction. Salesforce is a client management relationship (CRM) system that includes basic functionality around tracking accounts and contacts, building reports, and a lot more that we won't get into just yet. The highlighted fields are part of Salesforce itself, so you could see them in any Salesforce instance, from the biggest corporation to the smallest nonprofit. Accounts are super important to salespeople, so Salesforce is designed with accounts at its core. Every contact should have an account, and deleting an account will automatically delete all related contacts. Salesforce is built to be easily customized. You can add your own fields, tabs, reports, dashboards — pretty much anything. Before you start adding new fields to your system, get to know what's already there. There are lots of fields already included in HomeKeeper and the Nonprofit Starter Pack. Salesforce is the foundation beneath any app you install, inlcuding HomeKeeper. That means for many things, like creating reports or email templates you can look for how to's across the Salesforce community, especially if you want to really dig in to the possibilities. 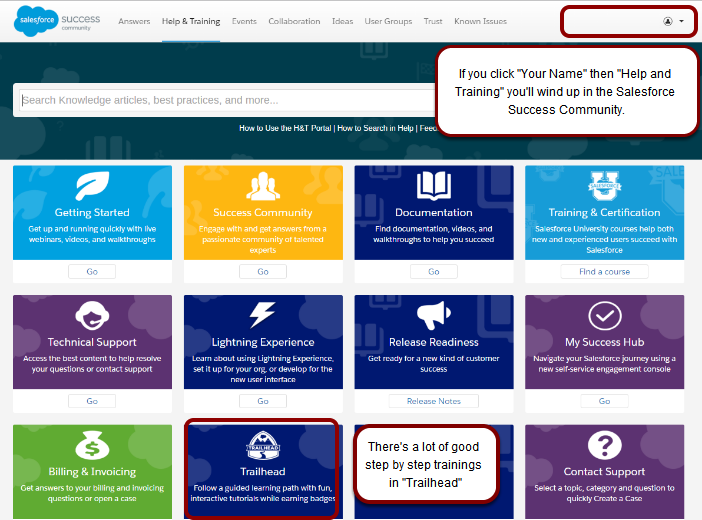 The Help & Training link at the top right corner of your screen will take you to Salesforce.com's support. To get started you might want to visit the Learning Center, which has lots of feature overviews and interactive training about Salesforce features. Salesforce recently unveiled a new tool called "Trailhead." You can take different tracks to help you learn how to different things in Salesforce.. run reports, build charts, administer your own organizations' security, and more! It's a lot of fun, and you earn badges for the lessons you complete. Every year, Salesforce (the company) holds a huge conference called Dreamforce. It includes lots of trainings and informative sessions, and you can find the sessions online for free at http://www.youtube.com/user/dreamforce. What is the Nonprofit Starter Pack? The Nonprofit Starter Pack is actually a set of packages that work together to adapt Salesforce to support nonprofits. 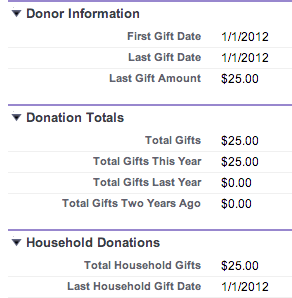 These packages handle things like donation tracking and managing households. They also help nonprofits work in Salesforce's account-centric world by automatically assigning contacts to accounts when one isn't specified. If you track donations, the Nonprofit Starter Pack has a lot of functionality that you'll want to use. Start by reading this introduction to the Non-Profit Starter Pack. If you want to customize or take the NPSP further, make sure that you understand the implications of any changes and have a staff lead to take on the project, as well as resources for consultant help if needed. We've configured your Salesforce setup so that it matches other HomeKeeper organizations. If you want to make a change to the Nonprofit Settings, make sure you understand the implications first. Most HomeKeeper users are on a legacy account model, called the Individual Account Model, where any contact that doesn't belong to the Individual Account. If it's working for you, you should keep it! If you decide you want to take advantage of the new functionality provided by Version 3 of the NPSP on the Household Account model, make a plan and be sure you understand the implications of upgrading first. HomeKeeper is compatible with either account model. Read more about the update and HomeKeeper's compatibility with the NPSP Version 3 and our considerations for upgrading. Join a user group! If you're in an area with a nonprofit Salesforce user group, you can meet with other users face-to-face to hear about how they've used Salesforce to support their work. See if there's a group near you by visiting http://www.salesforcefoundation.org/usergroups. Forcify.me (www.forcify.me) is full of training videos for nonprofits. It's free, and it's packed with good advice on topics like reporting, dashboards, customizing your system, and donations. There are lots of nonprofits using Salesforce, so many of the questions you have now may have already been tackled by your peers. To access their expertise, join the Power of us Hub and start searching. You can even post a question of your own! HomeKeeper is a package built to support affordable housing organizations. It tracks information about properties owned or managed by the organization, as well as service files for every applicant and homeowner. Some of this information is aggregated to a national database to help your program and the sector show their impact on making homeownership affordable. The Services tab is where you'll spend most of your time. Service Files track the whole history of your program's relationship with a homeowner, from when they first contact your program to when they resell their home to a new owner. You can always see what information is part of the national roll-up data by clicking the "Review National Roll-Up Data" link on the Service File (not shown). Check the HomeKeeper Support Forum at support.myhomekeeper.org. Click on the User Manual tab to get started, or search for a topic you're interested. Join us for monthly office hours and Q&As - check out our Training Calendar. Where can I find boilerplate language for a Homekeeper disclaimer?